Which Route Should I Use to Climb Kilimanjaro? There are seven established routes to climb Mount Kilimanjaro - Marangu, Machame, Lemosho, Shira, Rongai, Northern Circuit and Umbwe. The Marangu, Machame, and Umbwe routes all approach from the south of the mountain (Mweka is used only for descent). The Lemosho, Shira and Northern Circuit routes approach from the west. The Rongai route approaches from the north. The illustrations below depict a three-dimensional view of Kilimanjaro's climbing routes and a close up of the approaches to the summit. Selecting a route is a tough choice for most. To find the best Kilimanjaro route for you, considerations should be taken for the route's scenery, difficulty, foot traffic and its altitude acclimatization characteristics, as depicted in the table below. 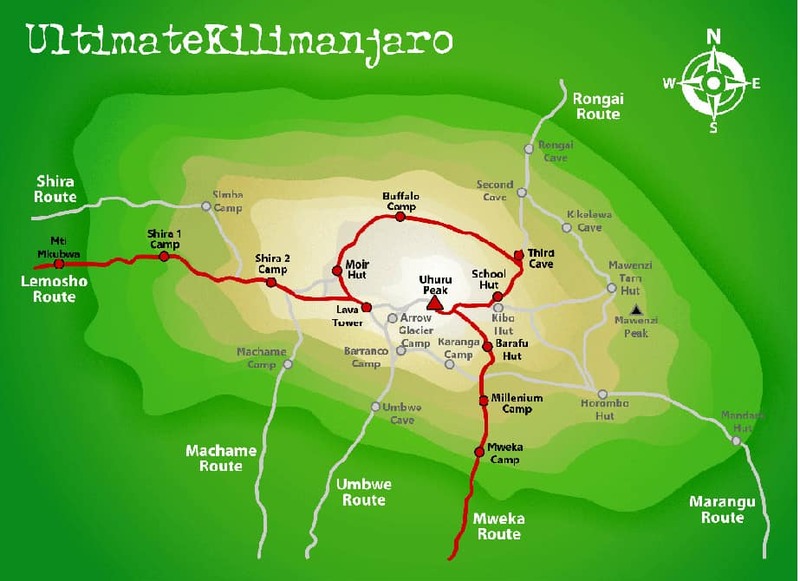 Ultimate Kilimanjaro® has assigned overall ratings to each route. It is estimated that tourists climb Kilimanjaro using the routes in the following percentages: Machame (45%), Marangu (40%), Lemosho (8%), Rongai (5%), Shira (1%), Northern Circuit (0%), Umbwe (0%). 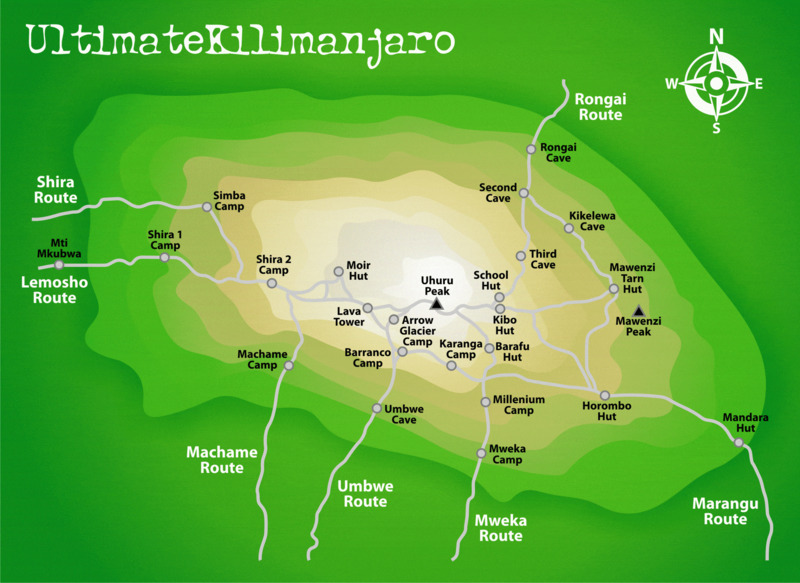 In contrast, Ultimate Kilimanjaro® clients use Lemosho (77%), Northern (10%), Rongai (6%), Machame (6%) and Marangu (1%). The reason for the difference in route popularity is that we favor the best Kilimanjaro routes - those with the most favorable combination of high success rates, excellent scenery, and low foot traffic. Detailed route descriptions, assessments, and profiles can be found below, along with a map of each of the Kilimanjaro routes. Known as the "Coca-Cola" route, the Marangu route is a classic trek on Mount Kilimanjaro. It is the oldest, most well established route. Many favor the Marangu route because it is considered to be the easiest path on the mountain, given its gradual slope. It is also the only route which offers sleeping huts in dormitory style accommodations. However, despite its immense popularity, we avoid leading climbs on the Marangu route. The route has the least scenic variety of all the routes because the ascent and descent are done on the same path and it is the most crowded route for that reason. Marangu is favored only during the rainy season, where the hut accommodations are preferred over wet ground, or for those who only have five days to climb Kilimanjaro (which we do not recommend anyhow). Otherwise, the Marangu route is a poor choice. Known as the "Whiskey" route, the Machame route is now the most popular route on the mountain. Compared with Marangu, the days on Machame are longer and the walks are steeper. The Machame route is considered a difficult route, and is better suited for more adventurous folks and those with some hiking or backpacking experience. The route begins from the south, then heads east, traversing underneath Kilimanjaro's southern ice field before summiting. The minimum number of days required for this route is six days, although seven days is recommended. The Machame route is scenically beautiful and varied. However, due to the heavy crowds, it loses some of its spendor. The minimum number of days required for this route is six days, although eight days is ideal. Lemosho is considered the most beautiful route on Kilimanjaro and grants panoramic vistas on various sides of the mountain. It is our favorite route because it offers a great balance of low traffic, scenic views and a high summit success rate. Thus, Lemosho comes highly recommended. Most of our clients use Lemosho. On the first day on the mountain, climbers begin their hike from 11,800 feet (3,600 m) and spend their first night at the same elevation at Simba Camp. Then, the route merges with Lemosho and follows the southern circuit route. Although Shira is a varied and beautiful route, Lemosho is recommended over Shira due to the relaively high altitude of Shira's starting point, which is accessed quickly by vehicle. It is possible that climbers will experience some altitude related symptoms on the first day while camping at 11,800 feet. The Northern Circuit route is the newest, most exciting route on Kilimanjaro. The trek follows the Lemosho trail in the beginning, approaching Kilimanjaro from the west. However, instead of following the southern traverse like all the other west approaching routes, the Northern Circuit traverses the mountain around the quiet, rarely visited northern slopes. The Northern Circuit route is a nine day climb, which is the longest route in terms of time and distance travelled. The days spent at around 13,000 feet are great for acclimatizion, resulting in the highest success rates for all routes on Mount Kilimanjaro. With a high success rate, incredible varied scenery and a very low number of visitors, the Northern Circuit route is certainly one of the best routes on Kilimanjaro. The Rongai route is the only route that approaches Kilimanjaro from the north, close to the Kenyan border. Though gaining popularity amongst climbers, Rongai has low traffic. It is the preferred route for those looking for an alternative to the crowded Marangu route, for those who would like a more remote hike, and for those who are climbing during the rainy season (the north side receives less precipitation). The minimum number of days required for this route is six days, and seven days are recommended. Although the scenery is not as varied as the western routes, Rongai makes up for this by passing through true wilderness areas for days before joining the Marangu route at Kibo camp. This route descends down the Marangu route. Rongai is a moderately difficult route, and is highly recommended, especially for those with less backpacking experience. The route is offered at a minimum of six days, though seven days is recommended when attempting this route. The Umbwe route should only be attempted by those who are very strong hikers and are confident in their ability to acclimatize. However, overall, the Umbwe route is not recommended and we discourage its usage for our clients. Just shy of the summit, there is a little used campsite known as Crater Camp (18,800 feet/5,750 m). It is called Crater Camp because it is a short distance from the source of Kilimanjaro herself, Reusch Crater (19,140 ft/5,800 m). Additionally, the campsite is next to one of Kilimanjaro's last remaining glaciers, Furtwangler Glacier. Staying at Crater Camp gives climbers an opportunity to climb to the crater rim, and to get up close to the glaciers. Crater Camp can be used the night before or preferably after a summit attempt. Ultimate Kilimanjaro® operates private climbs using Crater Camp on the 9 day Lemosho route and 10 day Northern Circuit route. An alternative route to the summit approaches Uhuru Peak from the west, called the Western Breach. The strenuous Western Breach ascends 2,800 ft (850 m) in about 1.25 miles (2 km), and requires some scrambling (climbing on hands and feet) at certain points. This path is very beautiful but also very challenging due to its rocky, steep slope. The Western Breach was gaining popularity by climbers using the Umbwe, Lemosho, Shira and Machame routes until rockfall claimed the lives of three climbers in January 2006. In response, Kilimanjaro National Park (KINAPA) closed the Western Breach. The Western Breach re-opened in December 2007. However, the route is still considered by prominent Kilimanjaro operators to be unsafe and to carry an unreasonable degree of risk. Ultimate Kilimanjaro® no longer utilizes the Western Breach approach due to safety concerns for clients and staff. Fifty miles (80 km) west of Mount Kilimanjaro lies is an often overlooked, but spectacular volcano. Mount Meru is 14,980 feet (4,565 m) high, and serves as a great warm up before climbing Mount Kilimanjaro (19,341 ft/5,895 m). In fact, it is ideal for altitude acclimatization and you may elect to climb Mount Kilimanjaro with a lower number of days after climbing Meru. On the mountain, there is a good chance of seeing wildlife, and the crowds that can be seen on Kilimanjaro are non-existent here. Many people who climb both mountains have a quiet preference for the humble Mount Meru. (c) 2007-2019 Ultimate Kilimanjaro®. All rights reserved.